Dimensions 0.80 by 7.20 by 9 in. Ability to select the most effective wireless LAN type from a wide assortment of recent and emerging standards. Independent assessment of competing wireless LAN technologies. More efficient design and operational support of wireless LANs because of an understanding of wireless LAN protocol operations and frame structures. Definition of typical requirements and technology assessment parameters, providing a basis for evaluating wireless LANs. Vision of the future of wireless LANs. Real-world experiences through case studies and implementation tips located throughout the book. Quick overview of the features, pros, and cons of each of the wireless LAN standards located at the beginning of each chapter. 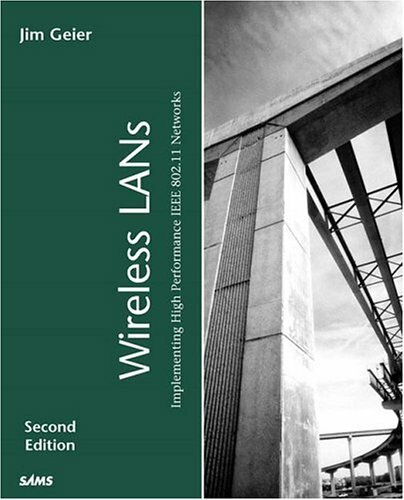 2 edition from Sams (July 19, 2001); titled "Wireless LANs (2nd Edition)"
About: This book provides the following benefits to readers: Ability to select the most effective wireless LAN type from a wide assortment of recent and emerging standards.